We are a leading Manufacturer & Supplier of excellent array of MDT- 72 Data Logger. We are instrumental in offering the best in class MDT- 72 Data Logger that is sternly manufactured in the state of the art manufacturing unit and that too using the cutting-edge technology and upgraded machines. 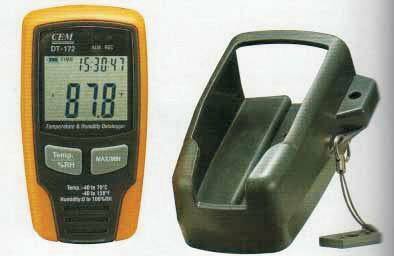 We ensure that the MDT- 72 Data Logger is as per the industrial standards. This data logger module can be used to monitor humidity and temperature of greenhouses, warehouses, food transports, aircraft cabins, refrigerated trucks, containers, museums, and HVAC equipment. It measures and stores up to 32700 relative humidity and 32700 temperature readings over 0 to 100%RH and - 40 to +70oC (-40 to +158oF) measurement ranges by your PC with USB interface. The LCD can show current readings in MAX, MIN and sign of alarms indications. Memory for 32700 readings (16350 temperatures and 16350 humidity readings). Dew point indication via Windows Software. Selectable measuring cycle: 2s, 5s, 10s, 30s, 1m, 5m, 10m, 30m, 1hr, 2hr, 3hr, 6hr, 12hr, 24hr. USB Interface for Set- up and Data Download. User- Programmable Alarm Thresholds for Relative Humidity and Temperature. Analysis software used to view graph for logging data. Multi- mode to start logging.